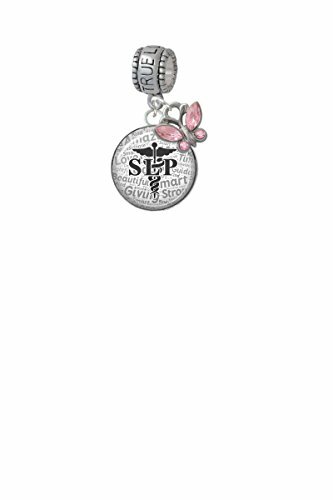 Glass Dome Black SLP - Speech Language Pathologist - True Love Waits Charm Hanger with Mini Pink Butterfly. Glass Dome Black SLP is approx: 0.9 x 0.7 x 0.2 inches (HxWxD) including loop. High quality printed paper sealed under a glass dome in a metal frame. True Love Waits Charm Hanger Bead is approx. 10.5x7x10.7 mm (HxWxD) Hole size 5.5 mm. Mini Pink Butterfly is approx. 13 x 12 x 8 mm(HxWxD). Our Charm Beads are compatible with most Charm Bead Bracelets. Also makes a great necklace pendant. These beads are wonderful for a starting a european large hole bead bracelet. Also available in other styles too! Check out our Bridal Party, Graduations, Religious, Crystal Birthday Colors, and many more! Glass Dome Black SLP - Speech Language Pathologist - True Love Waits Charm Hanger with Mini Pink Butterfly. Glass Dome Black SLP is approx: 0.9 x 0.7 x 0.2 inches (HxWxD) including loop. High quality printed paper sealed under a glass dome in a metal frame. True Love Waits Charm Hanger Bead is approx. 10.5x7x10.7 mm (HxWxD) Hole size 5.5 mm. Mini Pink Butterfly is approx. 13 x 12 x 8 mm(HxWxD). Our Charm Beads are compatible with most Charm Bead Bracelets. Also makes a great necklace pendant. These beads are wonderful for a starting a european large hole bead bracelet. Also available in other styles too! Check out our Bridal Party, Graduations, Religious, Crystal Birthday Colors, and many more!